Limo Anywhere is a ground transport service management software for limousines. The application assists businesses in better running their operations from the moment a customer books a transport to the time they reach their destination. With Limo Anywhere, businesses cater not just to their customers but to their drivers as well. The software aids in that regard by ensuring that employees receive correct remunerations and making certain that customers enjoy the service offered to them. Moreover, Limo Anywhere offers opportunities for businesses to expand their network. The solution is integrated with various travel booking systems that allow limo services to attract more customers from all over the globe. With Limo Anywhere, luxury transport businesses can track rides from the moment they are booked until the passenger has been dropped off. The application’s integrated ride management software ensures that every aspect of the trip is controlled and that customers have a comfortable and problem-free experience. Limo Anywhere has a dispatch grid that shows which driver is assigned to which passenger. This window also allows for multiple tripe assignments and real-time passenger flight tracking for punctual pick-ups. On top of that, the application also supports group text messaging to drivers through the dispatch grid to inform them of any important company notices. Limo Anywhere assists businesses in swiftly accessing customer information when needed. With a few clicks, a window is drawn up showing customer details such as their contact number and even their preferences for their rides. This allows transport businesses to tailor their services for optimum customer experience. With Limo Anywhere, transport companies need not worry about keeping accurate accounts. The application assists them in that regard by processing customer invoices and payments and also by tracking driver disbursements and incentives. This ensures that they run a profitable business while making both customers and employees satisfied. Limo Anywhere is not just for the business management. Native mobile apps are also available for both drivers and passengers that enable them to view details about their ride and to process in-car payments. For drivers, having a mobile app is convenient because they can speedily view their assignments and road plans while customers can book rides and check status updates. 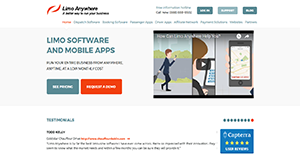 Limo Anywhere provides businesses the opportunity to grow further. The application’s network lets ground services find more customers in their service area and also attract bookings from corporations and travel booking platforms. If you are interested in Limo Anywhere it might also be sensible to investigate other subcategories of Best Car Rental Software collected in our base of B2B software reviews. Every company has its own characteristics, and can call for a particular type of Car Rental Software solution that will be adjusted to their business size, type of clients and staff and even specific industry they cater to. You should not count on finding an ideal solution that is going to be suitable for each business no matter what their background is. It may be a good idea to read a few Limo Anywhere reviews first and even then you should pay attention to what the service is intended to do for your company and your staff. Do you need a simple and straightforward app with just basic features? Will you actually use the complex tools required by experts and large enterprises? Are there any specific features that are especially practical for the industry you operate in? If you ask yourself these questions it is going to be much easier to locate a solid service that will match your budget. How Much Does Limo Anywhere Cost? Limo Anywhere also has add-ons available with varying prices. For more information, visit the website or contact sales. We realize that when you make a decision to buy Car Rental Software it’s important not only to see how experts evaluate it in their reviews, but also to find out if the real people and companies that buy it are actually satisfied with the product. That’s why we’ve created our behavior-based Customer Satisfaction Algorithm™ that gathers customer reviews, comments and Limo Anywhere reviews across a wide range of social media sites. The data is then presented in an easy to digest form showing how many people had positive and negative experience with Limo Anywhere. With that information at hand you should be equipped to make an informed buying decision that you won’t regret. What are Limo Anywhere pricing details? What integrations are available for Limo Anywhere? If you need more information about Limo Anywhere or you simply have a question let us know what you need and we’ll forward your request directly to the vendor.